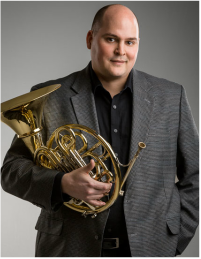 Dr. Zachary A. Cooper is Assistant Professor of Horn and Coordinator of Music Theory at the University of Montana. His private students have achieved full scholarships to study music at universities across the United States and his university students have successfully gained employment as educators and performers. Cooper frequently presents masterclasses and recitals at many schools and universities and is a strong proponent of educational outreach. He currently serves as the Secretary of the Northwest Horn Society. Prior to UM, Cooper served as an Early College Faculty Mentor, Lecturer of Music Theory, and Lecturer of Horn at Morehead State University. Cooper is principal horn of the Missoula Symphony Orchestra. From an early age, he has been an active orchestral musician, having performed with the Orlando Philharmonic and the London Symphony Orchestra (UK) as a teenager. At age 19, he won his first audition, a position as second horn of the Tallahassee Symphony, and has also held the position of third horn with the Kentucky Symphony until resigning in 2015. Additionally, he has performed with the Billings Symphony, Blue Ash Montgomery Symphony, Cave Run Symphony, Dayton Philharmonic, Helena Symphony, Huntington Symphony, Lexington Philharmonic, Lima (OH) Symphony, Memphis Symphony, Ohio Valley Symphony, Owensboro Symphony, Richmond (IN) Symphony, West Virginia Symphony, and Orquesta Sinfónica de la Universidad Autónoma de Nuevo Leon in Monterrey, Mexico. Cooper has performed live with Mannheim Steamroller and Blood, Sweat, and Tears. An avid chamber musician, Cooper is a founding member of several chamber groups, including the TradesMann Trio, Artisan Brass, and Cooper Duo. In addition to commissioning several new chamber works, he has presented lectures and performances and given world premieres at the International Women's Brass Coference, National Flute Association Convention, and Northwest Horn Symposium. Cooper is a previous winner of the Southeast Horn Workshop (SEHW) Solo Competition and the SEHW High Horn Mock Audition. Additionally, he has been a prize winner in the Susan Slaughter International Solo Brass Competition, finalist in the International Horn Society Farkas Solo Competition, and a semi-finalist for the William C. Byrd Young Artist Competition in Flint, MI. He earned a DMA in Horn with a cognate in Music Theory from the University of Cincinnati College-Conservatory of Music (CCM), an MM in Horn from CCM, and a BM in Horn Performance from Florida State University. Cooper's principal teachers have included Dr. William Capps (FSU), Duane Dugger (Cincinnati Symphony/CCM), Randy Gardner (Philadelphia Orchestra/CCM), and William C. Robinson, founder of the International Horn Society.